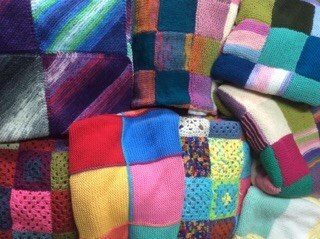 We love these blankets, each square hand knitted or crocheted and sewn together with care. They provide warmth but convey so much more. To the refugees it says someone is thinking of them, taking the time to make blankets to keep them warm. The beautiful colours and patterns echo the multiple languages and cultures of the refugees. Every volunteer who makes a square is valuable, as is every square made, for when we join the squares together we make a blanket that can save a life. Imagine if we all made just one square how many blankets that would be? How many lives saved. This year thousands of volunteers have offered a small or large piece of themselves, from making a blanket square to building a home. As these pieces have joined together, a movement has formed. A massive movement that covers the whole of the UK, showing love and support to marginalised people. The volunteer movement in this crisis is amazing, and like the blankets it is intricately stitched together by people who have never met but share an ideal; to keep people safe. Imagine how much noise would be made if every one of us stood up and shouted, “ enough”? Together we are so much more, we are powerful and our voice can be heard, let us use it to give these people sanctuary. Let us stitch ourselves together, young and old, black and white, rich and poor and like a blanket created by the love of strangers who offer shelter to those who need it. Donations of blankets for refugees in Paris and Calais will be gratefully received. They will save lives. Please email clare@care4calais.org for collection points.